You may remember Mr. Davenport from his videos on running Windows 95 and Minecraft PE on Android Wear. And those are just the ones we posted. He's really put that Gear Live to good use. In this case, he's using Mini vMac II to emulate the Macintosh II on Android Wear. 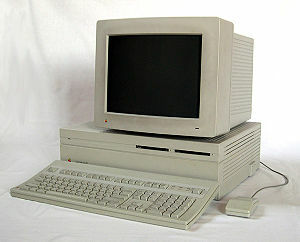 The Macintosh II was released in 1987 with System 4 software, but Davenport is booting it in the video with System 6 software from 1991. It's almost unusable on the Gear Live's tiny screen, but it technically works. It's actually pretty fast too. If you can hit the right button, things open about as fast as they did on the original machine. Crazy people take note—you can run this archaic OS on your watch now. Please don't, though.